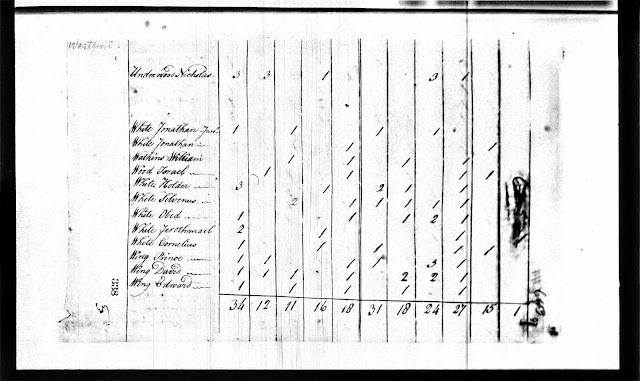 Genea-Musings: Treasure Chest Thursday - Post 321: 1800 U.S. Census Record for Jonathan White in Westport, Mass. Treasure Chest Thursday - Post 321: 1800 U.S. Census Record for Jonathan White in Westport, Mass. 1800 United States Federal Census, Bristol county, Massachusetts, population schedule, Westport, Page 625 (penned), Jonathan White household, digital image, Ancestry.com (http://www.ancestry.com : accessed 30 June 2016); citing National Archives Microfilm Publication M32, Roll 19. Unfortunately, this record is a near-alphabetical listing of the town inhabitants, rather than a listing of inhabitants in some order that might indicate neighbors. There were quite a few White families in Westport, and most of them were probably related. Jonathan White (1732-1804) and Abigail (Wing) White (1734-1806) are my 5th great-grandparents. I am descended through their son, Humphrey White (1757-1814) who married Sibel Kirby (1764-1848).